We dissect the performance of factor-based equity portfolios using a characteristics-based multi-factor expected return model. We show that generic single-factor portfolios, which invest in stocks with high scores on one particular factor, are sub-optimal, because they ignore the possibility that these stocks may be unattractive from the perspective of other factors. We also show that differences in performance between (i) integrated and mixed-sleeve multi-factor portfolios, (ii) small-cap and large-cap factor portfolios, and (iii) equal and value-weighted factor portfolios can be fully attributed to the differences in their factor characteristics. We conclude that efficient factor investing requires a recognition and understanding of how factor characteristics drive portfolio returns. "We show that generic single-factor portfolios, which are strategies that invest in stocks which score highly on one particular factor are generally sub-optimal, because they ignore the possibility that these stocks may be unattractive from the perspective of other factors. The negative contributions from other factors cause these strategies to have a substantial weight in stocks with negative expected and ex-post realized market-relative returns. We also show that some stocks have such poor factor characteristics that their expected returns end up being lower than returns on Treasuries. 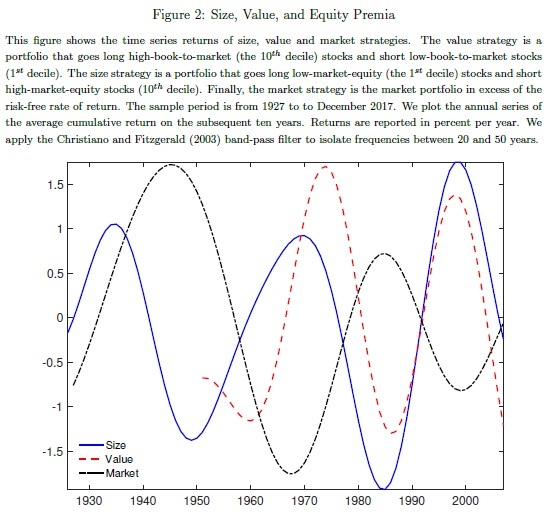 By simply removing those stocks from the market portfolio ex-ante, the realized market return increases by 16%, in relative terms, over the sample period that spans more than five decades. We examine what happens to performance if, each month, we simply remove stocks that have a negative predicted market-relative return from generic factor portfolios. The performance of such enhanced factor strategies is shown in Figure 6. 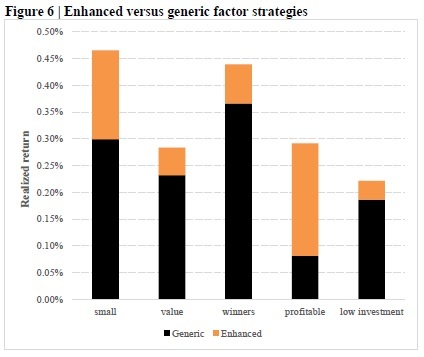 Compared to the generic factor strategies from which they are derived, the performance improvements are about 20% for the value, momentum and investment strategies and about 50% for the small-cap strategy. For the profitability strategy, performance more than triples, from 0.08% to 0.29% per month. This large improvement is not surprising, because a much bigger adjustment is made to this portfolio than to the other factor portfolios. These results imply that generic factor strategies are sub-optimal, and that, even when targeting one particular factor premium, investors should not ignore other established factor premiums. Excluding stocks with expected underperformance helps to enhance a single-factor strategy, but the resulting portfolios can still have stocks with negative exposures to other factors that detract from their performance. We next examine how performance changes if in addition to removing stocks with expected underperformance, we also require stocks to have a non-negative exposure (z-score) to at least one, two, three or four other, non-targeted premiums. 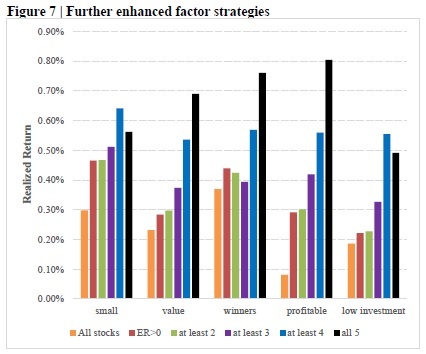 Figure 7 shows that realized, full-sample returns of each single factor strategy tend to increase as we require stocks in the portfolios to have non-negative exposures to more factors. For instance, our raw value strategy has a return of 0.23% a month, which increases to 0.28% per month if we ex-ante exclude stocks with negative expected excess returns. If in addition, at the time of portfolio formation, we require that stocks have non-negative exposures to at least two, three, four, and all five factor premiums, the strategy returns increase to 0.30%, 0.37%, 0.54%, and 0.69%, respectively. The number of stocks in the portfolio decreases as we impose more constraints from, on average, 302 with no constraints to 276, 273, 223, 96, and only 13. A similar pattern is observed for other factors, albeit not always monotonic. 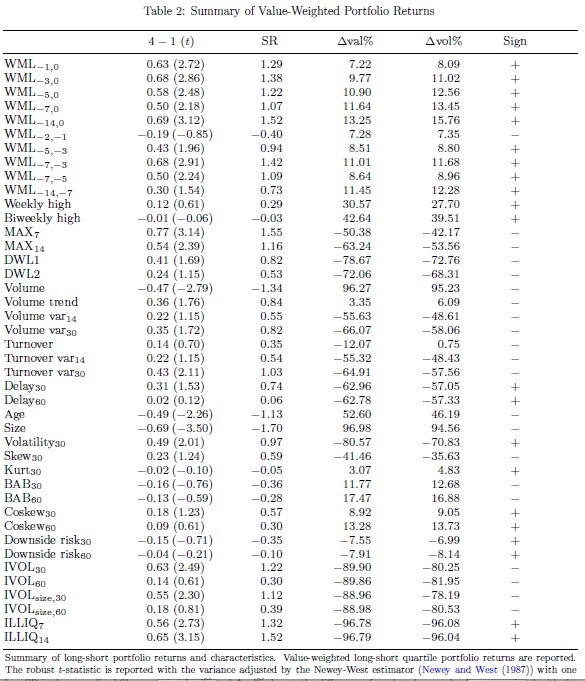 Our model is also able to attribute performance differences between integrated and mixed-sleeve multi-factor portfolios to differences in their factor characteristics, and thus resolve the heated discussion in the literature over which approach is better for construction of portfolios with exposures to multiple factors. We further show that return differences between factor portfolios in the small-cap and the large-cap space, and between equally-weighted and value-weighted factor portfolios can also be explained by our model." If behavioral biases explain asset pricing anomalies, they should also materialize in cryptocurrency markets. I test more than 20 stock return anomalies based on daily cryptocurrency data, and document strong evidence of price momentum. Unlike stock markets, price reversal and risk-based anomalies are weak, controlling for market and size. Cryptocurrency anomalies can be explained by behavioral theories that place more emphasis on the role of speculators than fundamental traders. "The speculative and hard-to-value nature makes the cryptocurrency market a novel environment that facilitates the study of behavioral impacts on asset prices. Because speculators account for the vast majority of cryptocurrency market participants, the behavioral impact can be stronger than traditional markets. Aside from this, cryptocurrency markets enjoy some good properties: the overall level of investor sophistication in cryptocurrency markets are much lower; there are only a few institutional investors until recently. Thus, mispricing can be severe. Above stylized facts of cryptocurrency markets fit well into many behavioral theories that particularly emphasize investor irrationality. Thus, if asset pricing anomalies can be explained by behavioral theories, they shall also be reflected in cryptocurrency markets. Having this in mind, I test more than 20 stock price anomalies based on cryptocurrency data. Interestingly, anomalies that are commonly recognized as behavior-driven, in particular, price momentum, are also observed in cryptocurrency markets. Price momentum describes the phenomenon that past winner (loser) assets may continue to outperform (underperform) in the future. The momentum effect turns out statistically significant and robust in various aspects. In contrast, risk-based anomalies, for example, return moment risks, are insignificant. The results are not surprising, as if the incentive for holding cryptocurrencies is largely speculative, it is not expected that exposure to certain form of risk earns a premium. Unlike stock markets, short-term price reversal in cryptocurrency markets is very weak at a daily frequency. No evidence of long-term price reversal is revealed. This empirical finding makes cryptocurrency anomalies distinct from stock market anomalies. The most plausible explanation of cryptocurrency momentum is given by De Long, Shleifer, Summers, and Waldmann (1990). Their model implies that overconfident noise traders push up the price and create risk that makes fundamental traders reluctant to combat mispricing. If noise traders dominate, overpricing can be even more severe, as is the case of cryptocurrency markets, where speculators play the role of overconfident noise traders. Further, their model does not predict a long-term reversal as long as noise traders remain overconfident. This situation is analogous to cryptocurreny markets and consistent with the empirical findings of this paper. Moreover, their model implies an excessive volatility, another empirical stylized fact of cryptocurrency markets." ffect subsequently vanished starting in the early 1980s to the late 1990s, before reemerging after 2000. We also observe that measures of microeconomic uncertainty, such as the cross-sectional dispersion in plant- and firm-level total factor productivity (TFP), sales, and payouts, exhibit similar low-frequency patterns as the size premium. Figure 1 illustrates that microeconomic uncertainty is strongly positively correlated with the size premium. In this paper, we demonstrate how persistent variation in microeconomic uncertainty can potentially rationalize the observed size premium waves. fined over aggregate streams of consumption. erent frequencies. Namely, the model generates a countercyclical size premium and reproduces the low-frequency wave patterns, including a large spread during 1960-1980, a disappearance between 1980-2000, and resurgence post-2000. The mean-reverting idiosyncratic TFP shocks helps to generate a negative relation between firm market capitalization and expected returns in the stationary distribution. rms are subjected to a larger history of negative idiosyncratic shocks that increases their exposure to longrun risks relative to periods with low TFP dispersion. As a result, the size premium is larger during periods of higher TFP dispersion. In the data, we find a very strong association between TFP dispersion and the size premium at low frequencies, consistent with the model predictions. 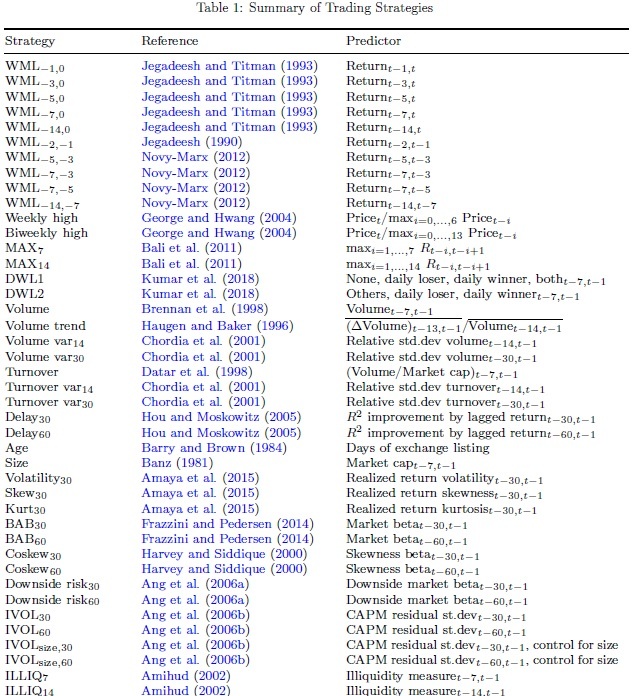 Calibrating the idiosyncratic volatility process to our empirical measure, we show that our model can provide a quantitatively relevant account of the observed size premium waves. 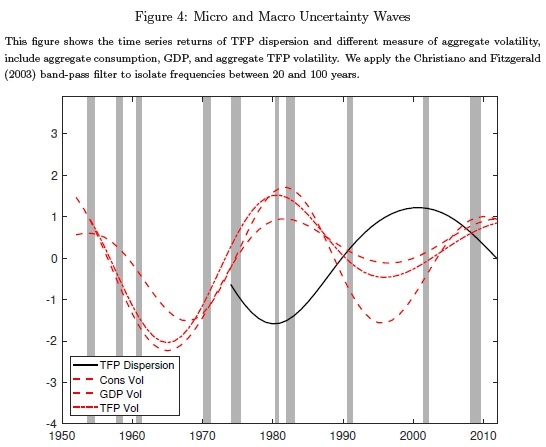 The equity premium is strongly correlated with macroeconomic uncertainty, as measured by the realized volatility of consumption growth, output growth, and TFP, but negatively related to microeconomic uncertainty at low frequencies. 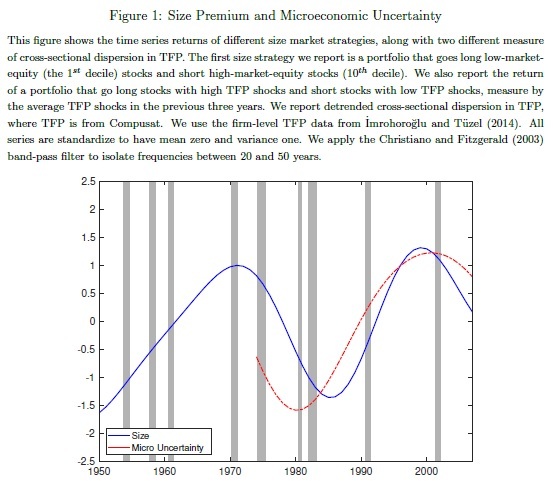 The correlation between the equity premium and macroeconomic uncertainty is 0.76, while the correlation between the equity premium and microeconomic uncertainty is -0.64 (See Figures 3 & 4). cant equity and value premia, inline with the observed magnitudes in the data. Persistent shocks to aggregate productivity growth are a source of long-run risk that help to generate a sizable equity premium when coupled with recursive preferences. Persistent second moment shocks to aggregate productivity growth generate a countercyclical equity premium. The size an value premia are strongly positively related at low frequencies (i.e., correlation of 0.66), but they are both negatively related with the equity premium at low frequencies (correlation between the size premium and the equity premium is -0.62 and the correlation between the value premium and the equity premium is -0.50). Figure 2 provides a visual depiction of these relations. rms have low payout shares today, but higher payout shares at longer horizons due to mean reversion. Therefore, value firms are more exposed to long-run risks than growth firms, thereby generating a sizable value premium. 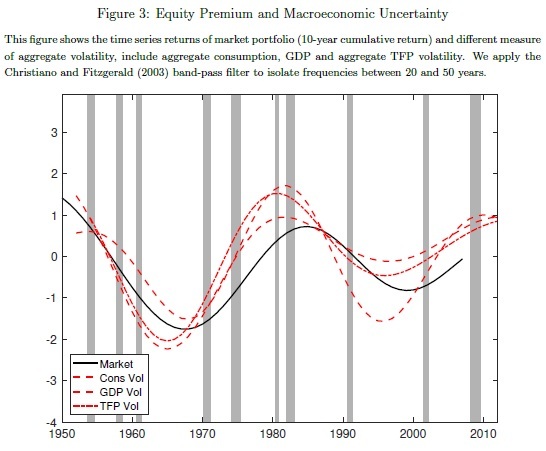 The low-frequency fluctuations of the value premium are driven by the persistent idiosyncratic volatility process." We would like to share an announcement from SSRN (Social Science Research Network) as we link a lot from Quantpedia to a research papers hosted on www.ssrn.com. We wanted to let you know about a planned outage to SSRN this weekend, which will mean you will not be able to access the site during this period. The outage will take place from 9am EST Friday 10th August until 9am EST Monday 13th August. Please ensure you download any papers you need before this planned site maintenance. This outage is to improve the robustness and performance of the platform going forward.